Lola, I do the same thing pretty much. If it's a drama - a 'serious' movie - or even a thriller - I look at the reviews. But my idea of what's funny is often not in sync with the reviewers. The American Pie film - first one - was panned and I thought it was hysterical! I guess you never know what's going to tickle your funnybone. Oh, and I loved Snakes on a Plane. Sometimes, a film that everyone raves about I can't stomach. The English Patient comes to mind. Eww. And I have fallen asleep, early on, during both of the two first Pirate of the Caribbean films. Go figure. Exactly!!! And yes American Pie was very funny! LOL Oh and I love Johnny Depp, but those Pirate movies were lost on me. I have actors I am like that with, Al Pacino is one, I would watch him read the phone book. I rented one of his that I actually missed not that long ago, it wasn't great, but I enjoyed just seeing him. Watching him speak and move. Maybe you are like that with Heath! Carbyville, fwiw, I understood exactly what you meant! I've watched some films just because Heath is in them. Same with Jake. But if I don't like it, neither of them can save it for me really. I know it's an outrage in some quarters here, but Zodiac didn't do anything for me and Jake didn't do anything for me in it. Casanova was a cute movie, but Lords of Dogtown was so bad, I couldn't make it through. Many years ago, I would watch any film with Mel Gibson in it, just to drool. Nowadays, he does nothing for me. It's nice that we're all different. It keeps things interesting! I fell asleep toward the end of Zodiac! lol I will still watch anything with Mel in it, but alot of people on this board hate him now. I will probably check out Heath in Batman, even though I don't like Batman movies that much! I guess its a bit different for me because I'm not a movie fan, I'm a Heath fan. When I watch a movie 9 times out of 10 it's a Heath movie, so regardless of any review, negative or positive, I'll watch it. Hi, everyone! I'm back again. I'm a serious movie baff since my teen age, that's how I got into BBM because it was so well-done movie ( this expression is owned by Opra!) and I haven't seen such a great film ever since. My obsession is lasting more than 20 months now. Heath grew in me as a great actor although I fancied Jack to start with. I've manage to watch all Heath's films that he performed from two Hands to Candy. I enjoyed Brothers Grimm as a beautiful fantasy comedy and decided to own it. 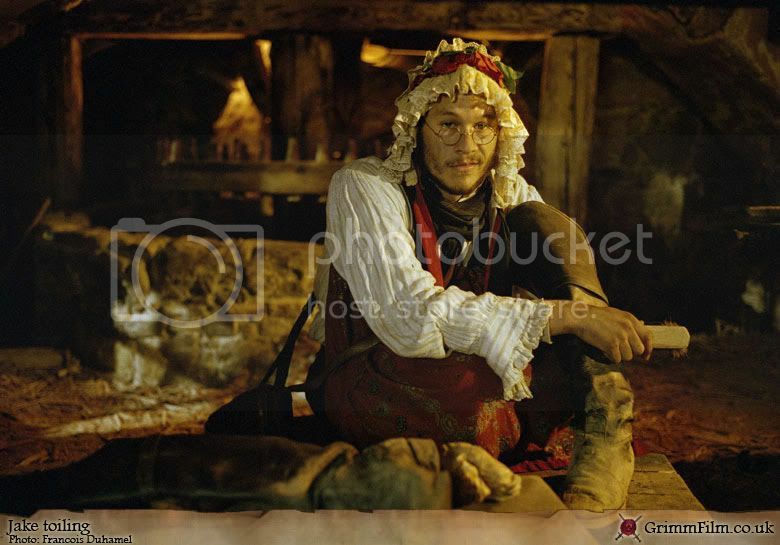 Terry Gilliam is a great director to manage to put Cinderella costume on Heath !! "I lived in the Twilight world for about four years. That's a very long time that demands a lot of patience on your part. "Thank God, I had the opportunity to do smaller movies like The Runaways, Welcome to the Rileys and On the Road in between. Otherwise I'd probably have turned mad." I just found this thread and have not caught up, so forgive me...or not! Chuck, I started with Ned Kelly, seeing it for the story not the star, and I was very impressed by the way Heath handled the role of Australia's national anti-hero. The history is a bit shaky but Heath has a certain quality about him which reflects Ned's own magnetic personality. Lords Of Dogtown is a great film. Skateboarding? Not my topic at all, yet it was an intelligent, warm and well-made little indie film and once again Heath was fabulous, playing Skip with a complete lack of ego. Two Hands is okay as a film but Heath is soooo good. Like I said, he's not afraid to just dive in and lose himself in a role. Candy is another good film. Everyone in it is very very good but Heath rises about them all. Seriously. He's almost too good to play against. I think if you watch enough of his films you'll be struck by his ability to totally change himself. CSI says he's a chameleon. He is never the same twice. Quite remarkable. And he doesn't play off his looks or charm, unless it's part of the character, as in Casanova. I've seen 3 of these 5, Marian-and I have to say he totally got lost in his character in Lords of Dogtown-totally blew me away-Chuck, I think you'd love that movie. Casanova was pretty comical-until the end, when we get a glimpse into the soul of the man-but frankly, the movie, well....let's just say it wasn't one of the better ones, IMO. I've yet to see Ned Kelly, shame on me. I tried to find Two Hands to rent, and I couldn't. My recommendation to Cellardweller for his next Heath-Experience is definitely to watch Monster's Ball. If only because Sonny is almost a practice run for the Ennis character. Heath can do "repressed" so well, it's absolutely heart-wrenching to watch. That movie is responsible for making me a Heathen, I was so blown away by his performance. BbM sealed the deal. I really liked the "Brothers Grimm"another example of Heath losing Heath inside a character-he is a born method actor. He does better when he doesn't act-when he just is......and don't think I could tolerate watching "Monster's Ball" again-way too raw and sad. OMG a few hours away and when i came back we have a brand new thread about Heath...i love it. I don't think I have ever paid attention to a single review of any film or album in my entire life. It isn't important to me what other people think of it, it is important what *I* and *I* I alone think of it and if I like it, then great, if not, I move on. I would never let a review sway my opinion of a movie no matter how good or bad the reviews were... but that's just me. But how do you decide which film would be interesting to you? Surely you'd go and read some accounts about the film, and they would almost always contain some review component. Or do you simply decide based on trailers? I was going to say yesterday when this new thread was up ( Hello and Thank you so much CellarDweller115 ! ), my recommendation for Heath's films after BBM is, as follows (chlonological order) in terms of his performance wise. I was particularly very surprised by his acting skills in Candy that a lot of people called it as his Post-Brokeback performance. He is not afraid of showing his vulnerable side in front of the camera and acting sympathetically to the character he plays. It's in a way nice to see how he grew and matured as an actor if you compare that with him in Two Hands. I thoght Dan (Heath in Candy) was so sweet and he seemed to charm ?? ?both woman (Abby Cornish) and man (Jeffery Rush) in the film but I should stop here, because this is supposed to be a serious discussion thread ! Hi, Katiebre ! How are you? Hello gres, I hope you'll enjyoy 10 things ! please come back to talk about our Patric later (either seriously here or completely screaming like a hysterical teenager at the Planet thread) !? Hello Canstandit, I know what you mean by his row performance ! I tend to like methodic-actor. Hi, Oilgun, I must see Tideland I haven't seen it yet ! Thanks everyone for your recs! I have some DVDs to rent! lmao! Please CellarDweller come back to us after you manage to watch any Heath's films to us I would like to hear it anytime or anythread.